ConceptDraw PROJECT is simple project scheduling software which lets you group separate projects into a multiproject that can share a common resource pool and a synchronized task schedule. You can create a detailed schedule of your project quickly and easy with ConceptDraw PROJECT. 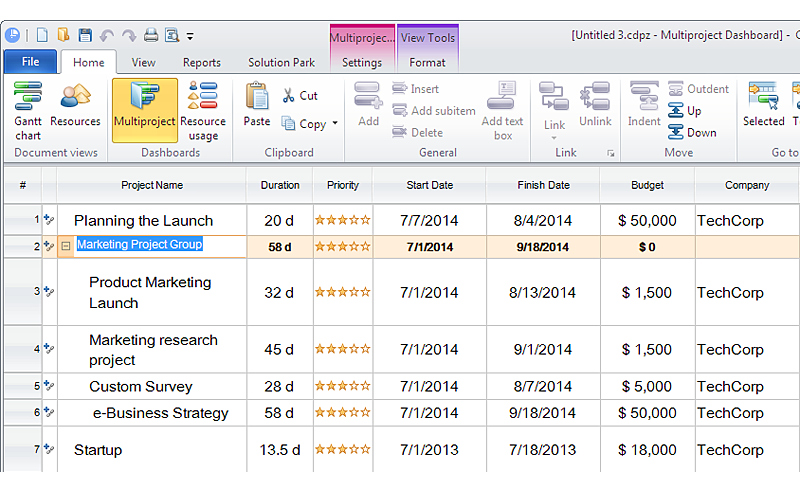 The Multiproject Dashboard helps you plan multiple projects while giving you a single, coherent overview. You can group projects. Project Group treats each project similarly to a phase, so it does not have its own tasks. This is typical feature of simple project scheduling software. By exploring many options with accurate data on all projects, you can make informed decisions and collaborate it with project stakeholders. Combining the typical planning tool with the Multproject Dashboard provides project manager with advanced vision of the ongoing project pool. Open Multiproject Dashboard View (Ctrl+Alt+J). Select the projects you want to group. Open the context menu (available with right click) and select Group projects. Name your project group. All the properties of the Project Group are aggregated from the projects you include. Result: These projects are now grouped, and their properties are aggregated to allow you execute the projects like large phases of an overall project.